Gourmet latte-on-the-go is here! Indulge in our gourmet coffee candy that is center filled with rich, creamy latte. Deliciously sweet, the frothy, milk center is a pleasant surprise. Savor the goodness as it melts in your mouth. 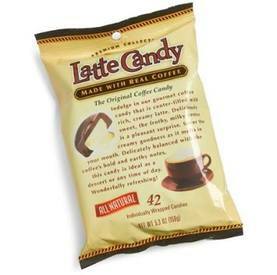 Truly a superior candy that is a coffee connoisseur's dream-come-true. Individually wrapped candies. MADE WITH REAL COFFEE! CLEARANCE SALE DUE TO EXPIRATION DATE OF MAY 8, 2015. LIMITED TIME OFFER, ONLY WHILE SUPPLIES LAST! !